Law enabling gov't to deport infiltrators illegally residing in Israel passed by Knesset, paves way for closure of Holot detention center. A plan to deport more than 40,000 illegal immigrants from Israel passed the Knesset late Monday night, paving the way for the implementation of program previously blocked by the Supreme Court. The Knesset voted just before midnight on Monday to pass a bill which would close the Holot detention facility, where thousands of infiltrators have been detained since a surge in illegal immigration less than a decade ago. The bill, which passed 71 to 41, would also empower the government to deport illegal immigrants who refuse to self-deport in exchange for compensation. Tens of thousands of illegal immigrants crossed into Israel over the past decade via the southern border with Egypt. 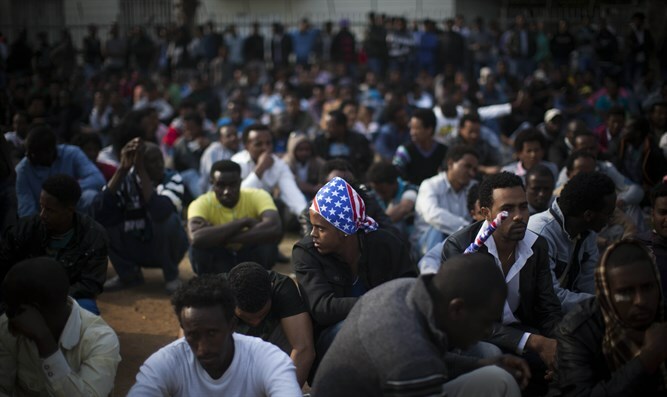 Most of the infiltrators came from Eritrea, Sudan, Somalia, and other countries in northeastern Africa. Following the construction of the border fence along the Israeli-Egyptian frontier, illegal border crossings plummeted by more than 99% - but only after nearly 60,000 illegal immigrants entered Israel prior to the construction of the fence in 2012. In 2014, the Netanyahu government implemented a “carrot and stick” policy to reduce Israel’s illegal immigrant population, then estimated at around 55,000. Under the plan, the government offered cash payments of $3,500 to illegal immigrants who voluntarily left the country either for their countries of origin or for ‘third-party’ states which had cut deals with Israel to accept illegal immigrants in exchange for monetary compensation. Those infiltrators who refused the offer were detained at the Holot and Saharonim detention centers. Some 15,000 infiltrators self-deported since 2014, though some 40,000 – not including children born to illegal immigrants in Israel – remain in the country. But in August of 2017, the Supreme Court blocked attempts by the government to deport those who refused to voluntarily leave the country, and ruled that detainees could be held at the Holot facility for no more than 12 months – essentially guaranteeing that illegal immigrants would be allowed to remain in Israel indefinitely. In the wake of the court’s decision, Prime Minister Netanyahu negotiated new agreements with third-party states, which agreed to receive not only those illegal immigrants who volunteer to leave, but also deportees. The law passed late Monday night will enable the government to deport recalcitrant illegal immigrants who have in the past refused to self-deport in exchange for $3,500 in cash, after the Supreme Court first ruled against forced deportations on the grounds that only voluntarily deportations had been covered in Israel’s initial agreements with third-party states. The bill also granted a limited three-month extension to the mandate for the operation of the Holot detention center, effectively putting a deadline for the deportation of those infiltrators now detained at Holot. MK Dov Khenin, the sole Jewish lawmaker in the predominantly Arab Joint List party, blasted the law, arguing that it ignored the real needs of poverty-stricken neighborhoods that have become home to large illegal immigrant populations, adding that the government was inciting locals against infiltrators, whom he described as “asylum seekers”. “The government talks in the name of the residents of south Tel Aviv, but in practice is abandoning them,” said Khenin.